How many of us really have it together when it comes to organizing our lists and schedules? I have my to do lists and the calendar on my phone, but nothing is really streamlined. I hadn’t even heard of the idea of a ‘bullet journal’ until Rugged Minimalist introduced me to their Bullet Journal Cover. This handsome, handy, bestselling accessory will help you organize and protect your bullet journal alongside a few other daily carry items. It’s been a pleasure to get to know Jason, owner and founder of Rugged Minimalist, over the last couple of years. Jason has a background in sales and marketing but, in an effort to pursue a more creative and more personally rewarding trade, developed an interest in product design that eventually lead him to leather. Over the last four years he’s been working on a variety of designs that focus on utility without excessive labelling or embellishment. Rugged Minimalist aims to make leather products of the highest quality. 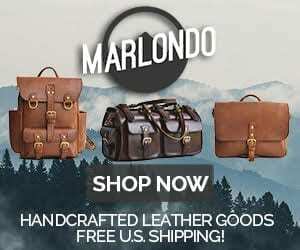 While using old world materials and techniques, Rugged Minimalist also strives to cater to the modern consumer: “Bags and accessories that do not feel out of place in the office, on a plane, or in the woods.” All products are handmade in Tennessee. The Bullet Journal Cover is made with top notch materials. Full grain bridle leather is both attractive and strong. This is a low maintenance leather that will last a lifetime. It strikes a nice balance in that it maintains some appearance of raw leather (read: visible grain) even though it’s actually a finished, protected leather. Leather is sourced from Wickett and Craig, a trusted American leather tannery. The cover is hand stitched using waxed linen thread. Linen thread isn’t as common as polyester these days, but it has similar strength when properly waxed and has a great appearance. Needlework on the Bullet Journal Cover is precise and strong. Sturdy brass hardware is used for reinforcing rivets and closure snaps. Rugged Minimalist offers a lifetime warranty on all of their products. I’ve had opportunity to discuss various build and design aspects with Rugged, and this is a company that takes pride in their work. There’s a few things to look for when seeking a notebook cover, and Rugged Minimalist has managed to check all the boxes. First and foremost, is the journal well protected? Yes, by sturdy leather, from nearly every side. The top and bottom are exposed to the elements, but the edges of the leather are thick enough to make sure no drops or bumps can damage your notebook. Closure snaps are secure and the cover won’t be accidentally opening. Since the journal itself is well secured in place inside the cover, it should have no problems remaining pristine. There’s some extra features Rugged Minimalist has provided as well. One must-have feature for me is a place to park your pen, which is provided via some slits in the spine. There’s also a variety of slots that could be used for cards, other small notebooks, receipts or spare papers, extra pens, etc. Since this is probably going to be part of your every day carry, may as well store some other EDC items within. Oh, one last thing I really like. The layout and choice of leather is such that, when opened, the cover lies completely flat. It’s a pet peeve of mine when you have to work and wear in a cover to lie flat, so big thumbs up from me here! While our main focus is to review the leather product itself, it seems appropriate to speak briefly about the bullet journaling system. Bullet journaling is a mix of your calendar, to-do list, and journal. I didn’t often use mine as a journal in the ‘diary’ sense, as I found it more useful as a planner. I think what gives bullet journal a unique edge is the fluidity of the organization. There’s an emphasis on “migrating” tasks. That is, when you didn’t complete a task, it encourages you to think about it: worth my time? Needs doing imminently? Can I put it off for a few weeks or months? It’s a highly customizable and unique way of looking at organization. I find myself annoyed when most protective cases tend to make an item uglier than without. You’re forced to choose between protecting the item or enjoying how it looks. Thank goodness leather doesn’t have this problem! 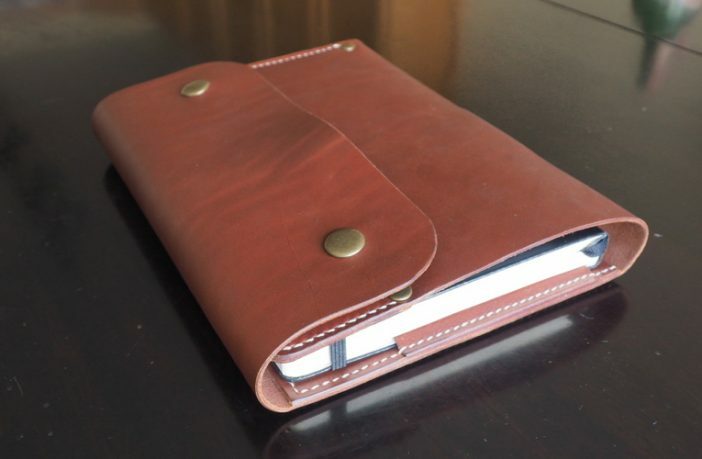 Rugged Minimalist has made a cover that far exceeds the appearance of the journal itself. No extra frillies or designs…just beautifully finished leather, sewn with precision and edged to perfection. Rugged Minimalist is especially careful with attention to detail when it comes to edging. Sometimes an unfinished edge has a certain appeal too, but a smooth, polished edge matches this leather best. Just seeing this cover on my desk gives me a little spark of happiness. My review sample is the Bullet Journal Cover in English Tan. Rugged Minimalist also offers the cover in standard Tan, Black, and Chocolate. A journal is a great companion. It can be for recording thoughts and experiences or for organization and scheduling. Protecting your journal with the Rugged Minimalist Bullet Journal Cover is a great way to enhance the experience. It will help your journal last, make it beautiful, and carry a few extra small items. I’m happy to recommend the Bullet Journal Cover as a Buy It For Life item.